경상북도 상주의 용화사에 모셔져 있는 이 불상은 광배와 불상이 하나의 돌로 조각된 높이 1.98m의 석불입상으로 마멸이 심해서 세부수법을 자세히 살펴 볼 수는 없다. 불상의 머리는 확실히 구별할 수 없지만 민머리처럼 보이며, 정수리 부근에는 상투 모양의 머리(육계)가 큼직하게 솟아있다. 얼굴은 길고 풍만한 모습으로 이목구비가 뚜렷하지 않지만 단정한 인상이다. 체구는 단정하며, 양 어깨에 걸쳐 있는 옷자락은 간결하게 표현되었다. 부처의 몸에서 나오는 빛을 형상화한 광배(光背) 역시 많이 마모되어 가장자리에 새겨진 불꽃무늬만 희미하게 확인할 수 있다. 단정한 체구에 다소 경직되고 현실적인 면이 강해진 특징을 가진 불상으로, 통일신라 후기 석불입상의 경향을 알려주는 작품이다. 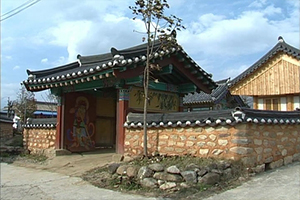 This statue of Buddha is enshrined in Yonghwasa Temple in Sangju, Gyeongsangbuk-do. 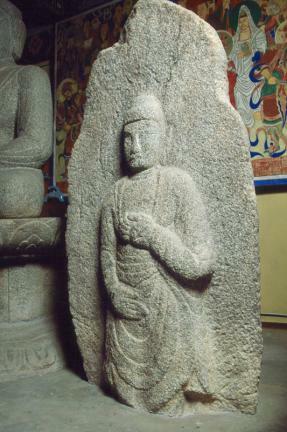 Both the mandorla (Buddhist halo of light) and body of Buddha are carved from one stone 1.98 meters high. This standing Buddha has been defaced a lot, so the details of the statue are hardly recognizable. 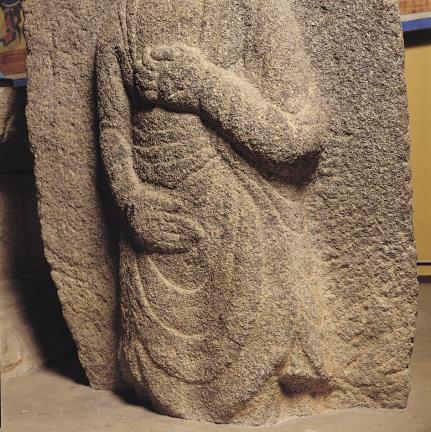 It is hard to distinguish the head of the Buddha, but it seems to be bald; the usnisa (a protuberance symbolizing supreme wisdom), shaped like a topknot, is relatively large. The Buddha's features are not clear, but the face is long and plump, and it has a smart appearance. 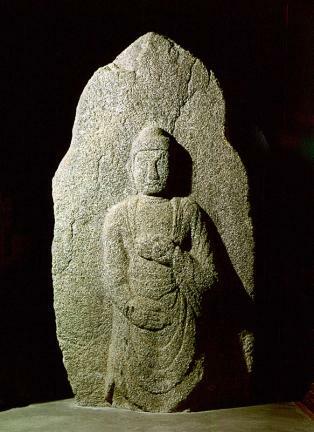 The body of the statue is neat, and the Beobui (sacerdotal robes) on his shoulders is carved very simply. The mandorla, which gives shape to the light coming out of the body, is very worn out; thus, only a glimpse of the spark pattern can be seen on the edges. The body is neat yet stiff in some ways. Note, however, that this is a piece with strong realistic sides to it. 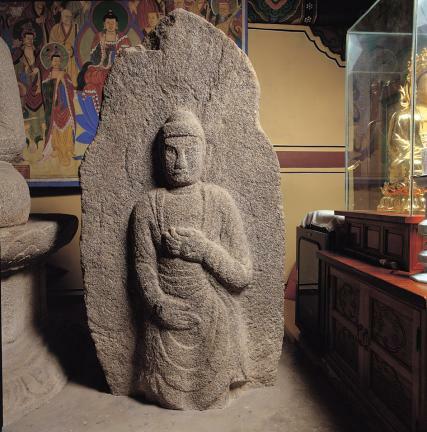 This standing stone Buddha is a piece showing the style of the late Silla Dynasty.